Here is a quick video of how Bernie Marcus, founder and CEO of the Georgia Aquarium, and the rest of the team over at the Aquarium are building an amazing dolphin display: At&T Dolphin Tales. Marcus’ love of the ocean and particularly, big fish, began early on in his childhood. Various accomplishments in his life (co-founder of The Home Depot), have afforded him the opportunity to help bring the Georgia Aquarium to life. After building the largest aquarium in the world, Marcus went on to say that “I’m hoping this sets the stage for future aquariums.” In 2008, expansion for the AT&T Dolphin Tale began; an 84,000 sf facility housed on 1.1 acres. 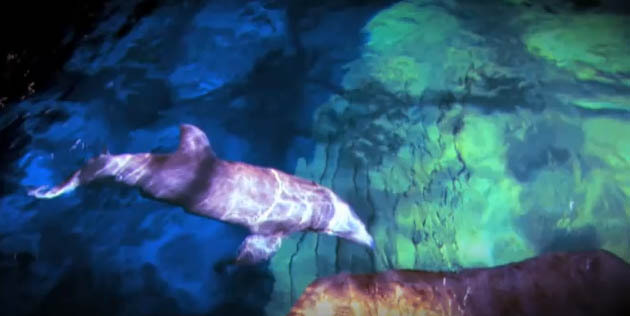 Composed of primarily two floors, the display includes an interactive section, a dolphin show, and a dolphin viewing gallery. Check out this video for a quick glimpse.